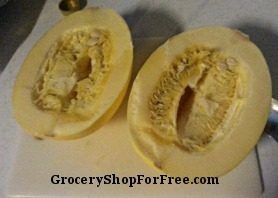 You are here: Home / Recipes / Low Carb Recipes / How To Cook A Spaghetti Squash! When I started eating a low carb diet I missed my pasta and rice a lot and it was so hard to find good substitutes. 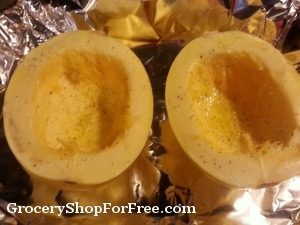 Everyone raved over how great Spaghetti Squash was but when I found it I had no clue how to cook it so I figured I would share with you How To Cook A Spaghetti Squash so you wouldn’t be lost like I was when I started this journey. Unlike other squashes that can be sliced and fried, boiled or steamed the spaghetti squash works best as a fake pasta when you bake it. 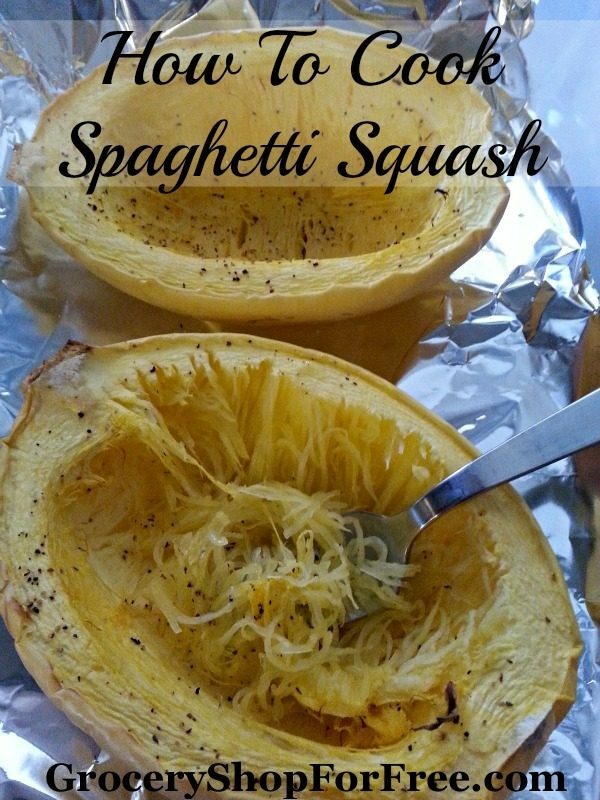 Slice your Spaghetti Squash in half lengthwise. Scoop the pulp and seeds out of the middle much like you would a melon. Drizzle with a little olive oil and season with some salt and freshly cracked black pepper. Just a little across the tops of each. Remove from oven and use fork to remove now cooked pulp which will pull apart in “strings” that appear like spaghetti. We love this as a side to Asian dishes. It’s a great item to serve with stir fried vegetables and a sweet and sour pork, chicken or pepper steak dish. We also like to use it as a base for spaghetti and turkey meatballs with a fresh pasta sauce. Heavy sauces don’t work as well with this as light sauces do. Whip up your favorite shrimp scampi and toss this squash with a bit of the sauce and shrimp for a high fiber, low calorie and super satisfying meal. I love spaghetti squash! I cook it without oil… pouring a cup or so of water into the pan and baking as you said. I’ve heard of substituting spaghetti squash for noodles but never tried it. Thanks for the clear tutorial.